ad4mat Mobile, Native, Banner advertising network details. 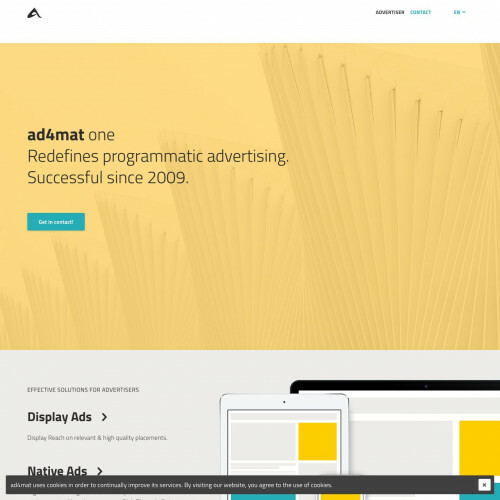 Ad4mat is a European Premium Performance Network focuses on performance display and digital advertising. Its cutting-edge technology provides webmasters with an above average repeat visitor ratio, thus increasing sales, upselling, and cross-selling. It also offers clients unique performance display solutions to boosts their display campaigns on a sustained basis. With years of experience, Ad4mat is confident to satisfy any customer's needs through fruitful collaborations. At Ad4mat, technology and tools are constantly leveraged to drive data and enhance audience targeting. Its support team consisting of professionals in advertising are devoted to assisting clients in no time. You can check Ad4mat reviews on Affbank and ask Ad4mat Team any question by using the contacts above, especially about how to earn money!